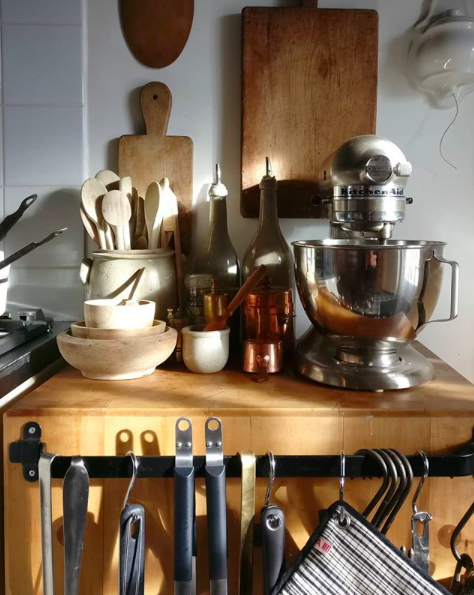 The kitchen continues to be a place in the home that draws my eye, and when La Canache’s IG feed spotlighted @cat_in_france‘s stove in her Normandy kitchen, I immediately went to her account and then her website and now want to share with you, TSLL reader and fellow Francophile. I am enamored. 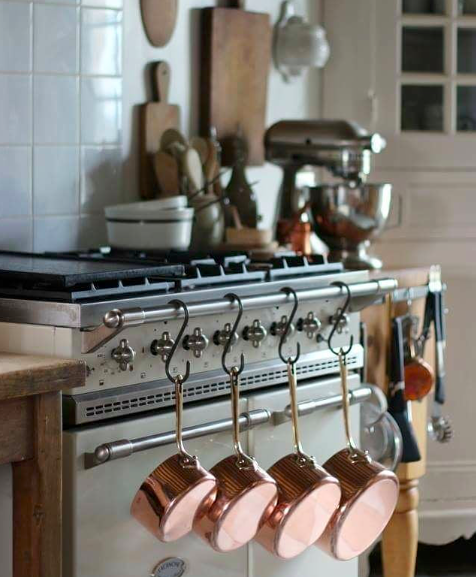 After my post from two weeks ago focused on precisely this stove, seeing one in a French kitchen demonstrated how old and new can work so amicably together. While I have rounded up three images from Cat’s Instagram feed, you will want to check out everything she has shared. 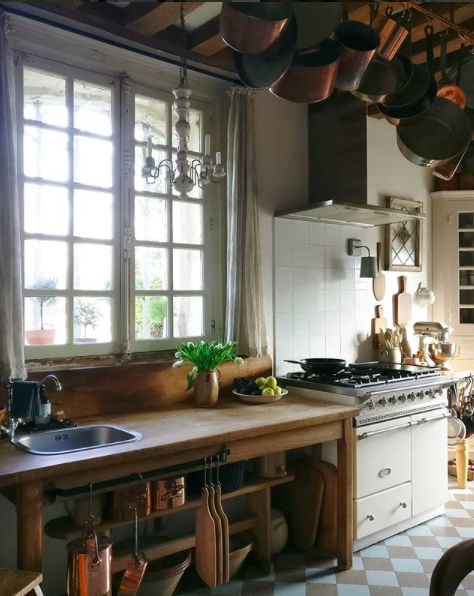 Her story is delightful as to how she ended up in Normandy, and now she offers cooking and foodie workshops which incorporate visiting the local markets, shopping at brocante fairs and enjoying the beauties of northern France. As well, she offers pop-up online brocante shops on her website – see what they are all about here – so that no matter where you are in the world, you can peruse beautiful finds from France and bring them home. So about her story. She was living in southern California, met her now French husband and ended up now living with her many animals and children and husband (one of her pets is a Cavalier King Charles, so you know I took note) in a 376 year old farmhouse. As a writer and a photographer, her life is not a dream; it is indeed real, and she is my new favorite follow, and perhaps yours as well (if you don’t already follow her). I have followed your blog for a long time and love your book which I’ve also given as gift many times now, I listen in to the weekly podcast here from England where I live in a market town close to Cambridge. I have also followed Cat at Rabbit Hill for a long time and like you think her blog and Instagram are wonderful. They had a tough time at Rabbit Hill last year which you’ll pick up when you read through her stories so it’s great to see them doing so well again this year, her photography is so inspiring and yes especially her kitchen! Thanks for also being a great inspiration in your readers daily lives. Thanks for sharing Cat ‘s story. Had a quick browse and like what I have seen. Wishing you a very smooth and happy move. So excited for you! I am building a new home at the moment, and am just weeks away from moving in. I have chosen a LaCanche range, Beaume in a soft grey colour with gold knobs which has been made for me and is now waiting to be installed. I am so excited. My kitchen is modern with man-made Carrara marble look stone benches and splash-back over glossy white cabinets but I have converted 4 carved Chinese screen panels into cupboard doors which are also white and have used brass bamboo-look handles on all doors. It will be a very different look from this kitchen above but we will share our cooking experiences with our beautiful ranges. It sounds beautiful. What a lovely place to cook. 🙂 Thank you for sharing. Cat, it is my absolute pleasure! You have a beautiful home and inspiring lifestyle. Do let me know if you’d like to join me on my podcast as my listeners would enjoy hearing from you. All my best.